When Has A Car Company Betrayed You? Sometimes, the carmaker you love and cherish and write poems about and plan your honeymoon with betrays you. It tears your heart in half and you just want to die. Today we suffered one of those moments. 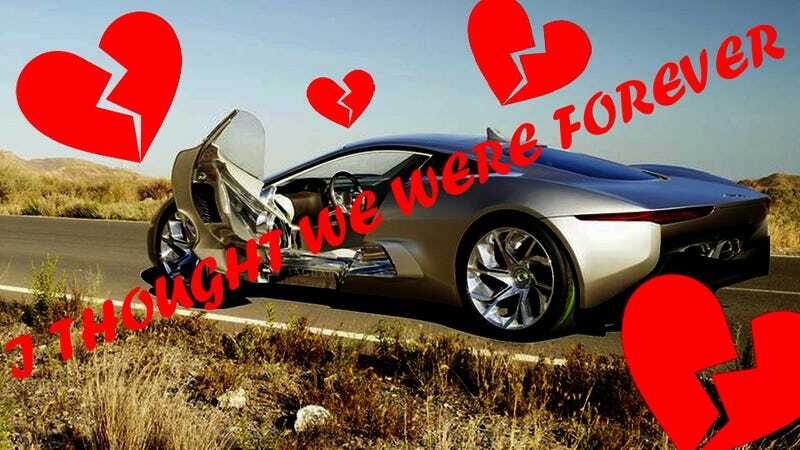 Yes, Jaguar killed their hybrid wondermachine, the C-X75. 900turbo wept with us. Actually I have the urge to lie on the couch, surrounded by stuffed animals, eating ice cream, wearing footies, watching the movie Beaches. I did it when Alfa left the U.S. in 1995. I did it when they announced the demise of Saab. I did it when my daughter asked me for a Camry. I will do it again for this miscarried Jag. When else has a car company broken your heart?